Light Stax is a set of extraordinary building blocks – or Stax – that light up when connected to a power base or other lit Stax, through a patented LED technology. It aids in cognitive development and boosts one’s creativity and imagination. Building blocks are a classic toy enjoyed not only by kids but also by adults. 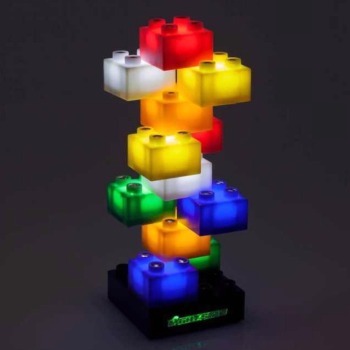 Parents looking for a toy that will aid in the cognitive and creative development of their child would definitely like to get a set of these light-up building blocks. These are also good for bonding activities with the family or even a group of friends. The concept of making what would otherwise be normal or regular building blocks light up is quite something. It’s actually a very simple idea, which makes us wonder why no one’s thought of it before. The three different settings that we see in the Starter Set, for instance, make these building blocks multi-functional. The settings include Solid Light, Flashing, and Fading. Using these settings, these blocks can also act as a night light. The different colors of the Stax also make the overall effect even more attractive. But what if you already have traditional building blocks? Will they become useless when you have Light Stax? Of course not. The Light Stax, although they are more modern, are still compatible with older building blocks. Of course, the traditional blocks are not going to light up, but they can still be used to create or build, when combined with the Light Stax. Whenever light or power is involved, many parents worry that it could lead to accidents such as electrocution. That is not going to be a problem with Light Stax, since there are no special wires or connectors needed. The power base is battery-operated, and you don’t have to wire the other Stax in order to make them all light up. Through power transference, the Light Stax will light up as they stack them on top of each other. At the moment, only the Starter Kit has been introduced, with the promise that more add-ons and accessories, as well as product variations of the Light Stax will be released in the latter part of the year. We still do not know whether it has features that are not up to par with our expectations. The price of the Light Stax is not yet officially announced, although the Light Stax Starter Set is expected to be around $30.00. No information regarding product guarantee and warranty has been released yet. The Starter Kit is estimated to sell for around $30. This is slightly more expensive than ordinary building block sets. However, the lighting-up functionality definitely sets it apart from the usual building blocks, which justifies the higher price, especially since it received a Best of Toy Fair award from Popular Science magazine! The Light Stax will be available in Light Stax’s retail partners, as well as from merchant sites such as Amazon. Stack ‘em and watch them light up! Light Stax will forever change the way you see and enjoy building blocks.